Perfect screwdriver storage! 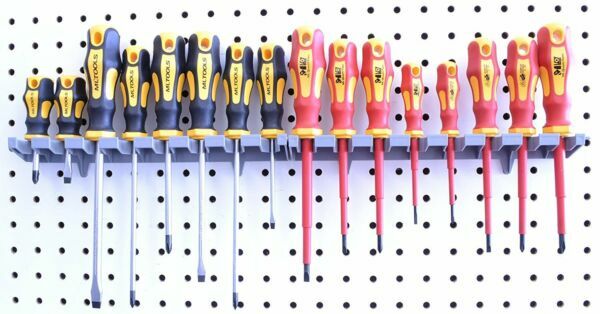 Organize your garage or workspace with the V-Slot Screwdriver organizer. Designed for use on all common pegboard sizes. The Patent Pending “V” Slot securely holds a wide variety of tools. Tools tilt slightly for added stability on the wall. Available in gray. Dimensions: 10.75” x 2.5” x 1.5” Made in USA Lifetime Guaranteed! Order Processing time is approximately 3-5 business days (excludes weekends and holidays). If an item is on back order, the delivery time can be delayed. When that happens we will notify you and make other arrangements if possible. International mails require more time due to lengthy customs process. Returns are accepted and RMA numbers are required. Items are to be returned only in their original condition. Please notify us within 14 days of receipt. Please do not hesitate to email us if there is any question or concern. We want happy customers and your satisfaction is our top priority. Thank you very much for shopping with ML Tools & Equipment!